The fishing vessel sank off the coast of the Kamchatka peninsula in Russia’s far east. 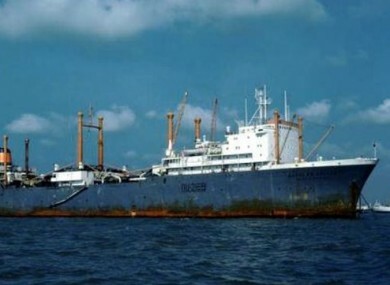 The Dalniy Vostok, the sunk Russian trawler. AT LEAST 54 sailors have died and 15 others are still missing after a trawler with 132 people on board sank late yesterday evening in the Sea of Okhotsk in Russia’s Far East according to Russian media. “We have recovered the bodies of 54 victims. 63 crew members have been rescued alive,” Russian news agency Tass reported, saying that 15 sailors were still missing. The Dalniy Vostok sank at around 6:30 am (2030 GMT Wednesday) off the coast of Kamchatka, 155 miles south of Magadan, the main town in the sparsely populated region of Russia’s Far East. An officer from the local maritime rescue coordination centre told Tass that 78 Russians were on board the vessel and at least 40 people from Myanmar. Nationals of Ukraine, Lithuania and Vanuatu were also on board the trawler, a 5,700-ton, 104-metre long factory ship designed for carrying several dozen sailors on fishing trips for several months. The vessel was operated by Magellan, a company based in Nevelsk, a port city on the island of Sakhalin in the Russian Far East. “According to initial information, 40 injured people will be evacuated to a hospital by helicopter,” the Magadan district press office said in a statement, adding that they had not taken part in the rescue operations due to the remoteness of the trawler at the time of its sinking. “A total of 800 people participated in search and rescue operations,” the statement said, adding that 26 fishing vessels were involved in rescuing survivors. The cause of the accident has not yet been determined, the district press office said, but Russian media raised the possibility that the ship may have hit ice floes. The Russian Ministry of Emergency Situations did not respond when contacted. Many fishing vessels trawl the fish-rich seas of the Russian Far East. Last December, the sinking of a South Korean fishing boat in the Bering Sea, between the eastern coast of Russia and Alaska, left 27 dead and 26 missing. Email “A Russian trawler has sunk leaving at least 54 people dead”. Feedback on “A Russian trawler has sunk leaving at least 54 people dead”.